Good news to all Banco de Oro (BDO) account holder. Are you running out of load? Need not to go outside look for the nearest store or loading station to buy a load. Using BDO online banking you can now easily reload your SMART, Talk ‘N Text, Globe, Touch Mobile (TM), or SUN prepaid phone without hassle and BDO guaranteed this service is free of charge. Step 1: Be sure that your BDO account currently enrolled in BDO online banking. If not, follow the instructions in this post How to Register or Enroll to BDO Online Banking. Step 3: In this step you can use either of this two way, you will arrive on the same page. A) Click the arrow sign on the “Actions” field to popup the shortcut menu, then select “Buy a Load” or B) Use My Quick Links “Buy a Load” icon. See the screenshot. 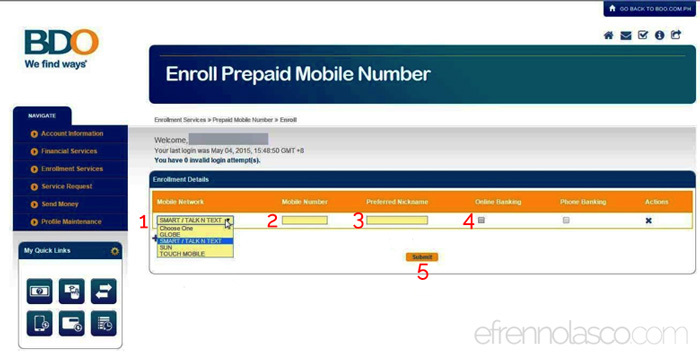 Step 4: Under “Buy a Load” page, Click “Enroll Prepaid Mobile Number” to enroll the mobile number that you want to be loaded. Step 5: To enroll your prepaid mobile number, choose Mobile Network, enter Mobile Number, Preferred Nickname and check Online Banking checkbox then click submit. A confirmation screen with your Reference Number is displayed. You can double check the Enrollment Details Summary if data entered correctly. Step 6: You can now proceed to Buy A Load menu, See step 3. Fill in the Reload Details and select Reload Schedule by checking the checkbox, then click submit to process your load. Step 7: A confirmation screen with your Reference Number is displayed which can be printed for reference. 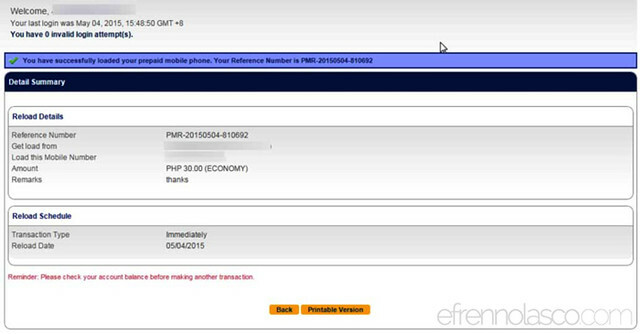 In addition, the reload(s) made will appear on your Transaction History screen so you can see when they were posted. That’s it, you’ve now successfully transfer load from your BDO account.